I’m going to let you in on a not-so-little secret….I LOVE THE HOLIDAYS! For the past 3 years, I would toy with the idea of getting a tree or not getting a tree. I decide to go for it this year. The mister said he wanted a real tree, to which I reminded him that we live in a penthouse walk up and asked if he wanted to deal with that? Thousand guesses what his answer was? #no “But babe, I love the smell of a real tree…” First off, don’t we all? Secondly, “I’ll get you a fir scented candle.” Solves that problem. 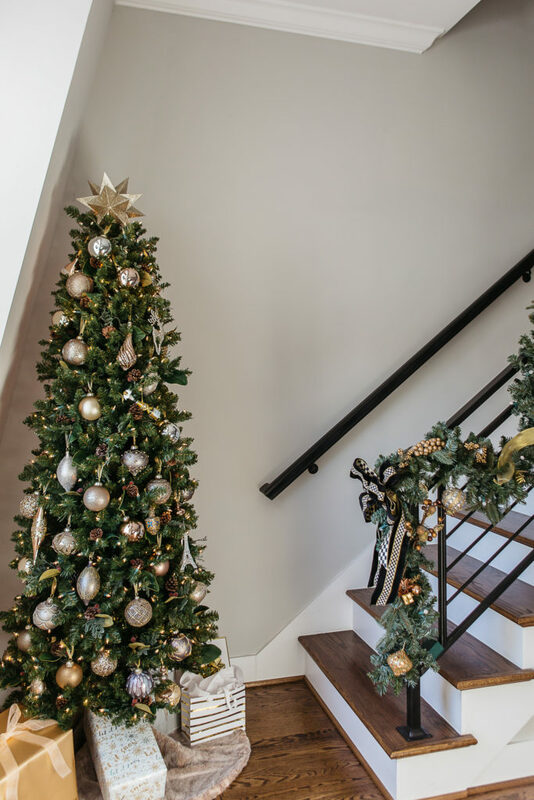 I went on the hunt for a beautiful, faux tree. This actually took a good little while to find, because I have to be honest, many faux trees look cheapy. I wanted to find one that was as life-like as possible. Really happy with my choice – especially the magnolia leaf, pine cone and berry accents throughout which give it a lovely look. The cherry on top was that it is prelit…because I was NOT interested in having to string lights. In addition to the look, I needed to be conscientious about the size. I really only had one place in mind to put it…in the living room, by our the stairs leading up to our wet bar and roof deck. Given this space, I’d have to go with a slim tree (that wasn’t wide at the bottom) to allow for easy movement around it. 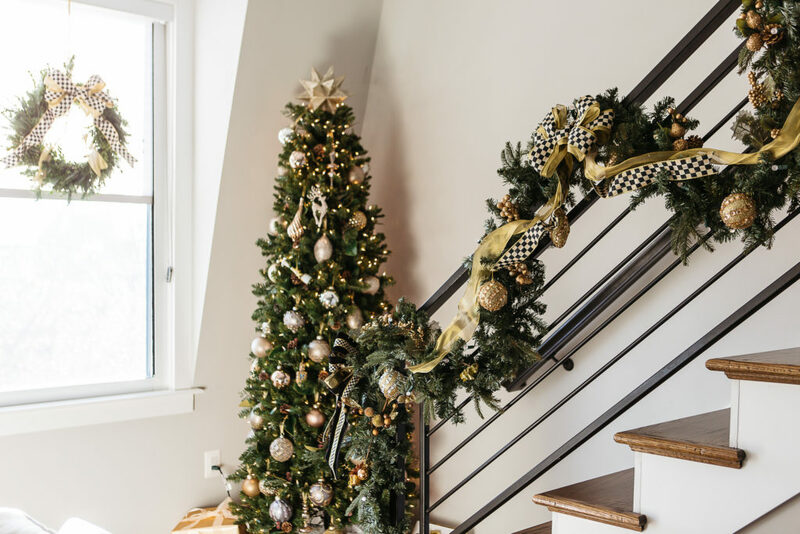 Tip: If you don’t have room for a standing tree in your home, try a tabletop tree (like this or this). You could also just decorate with festive greens in your floral arrangements (which will give you that smell we all love). You can find greens at your local florist or pick up leftover greens, at your local tree lot – fo’ free! 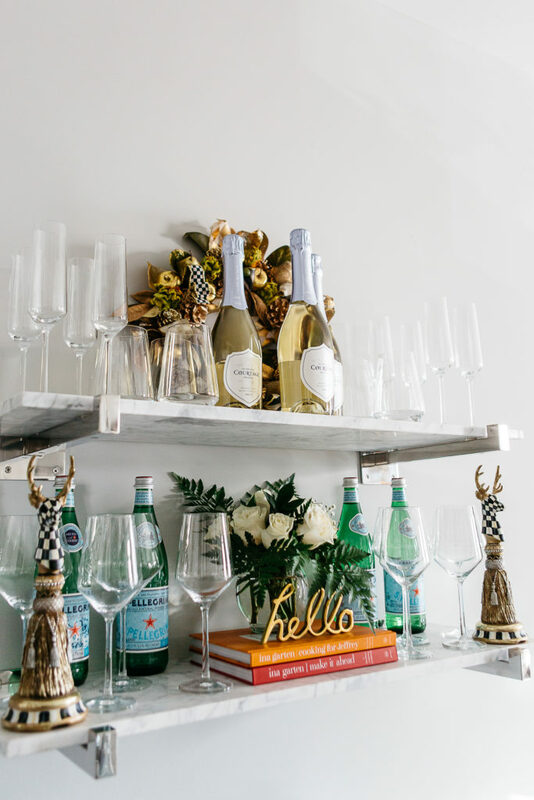 Your shelving is a the perfect place to get festive! 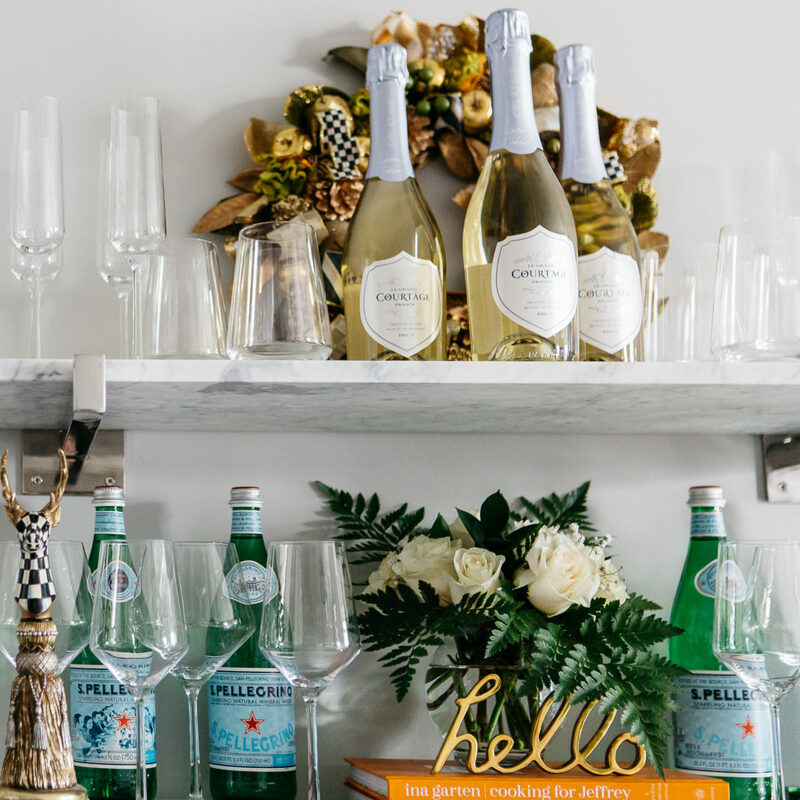 You already know I love to switch up my shelving, and the holiday season is no different. I ordered this gold wreath from Mackenzie Childs (old, but similar here and here) our first Christmas in our condo which ended up being very small on our door. So this year, I pulled it out of storage and decide to use it on our shelves since I was going for a mixed metal theme this year. I of course added bottles of champagne (which you know I always have easily accessible), fresh flowers and these pretty decorative Mackenzie Childs deer. Fun fact: the deer are actually stocking holders. I removed the bottom hook and instead used them this way. Play around with your goodies! They also have super cute penguin holders, that you could use in the same way! Use your shelves to add little touches. Have a large decorative bowl on your shelf? Fill it with ornaments. Pick up another wreath and set it on your shelf with a pretty ribbon or bow. Whatever you decide just remember its another vehicle to carry out your holiday vision! A favorite of mine for any occasion! 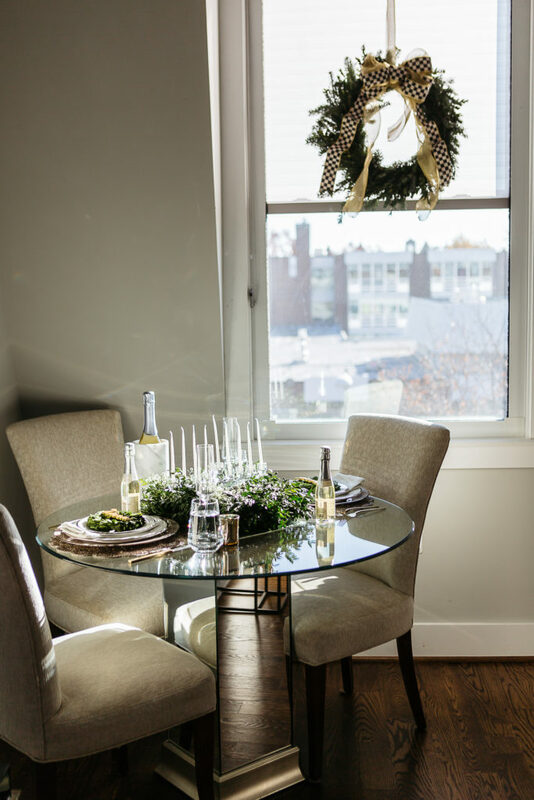 Your dining table is a great place to get festive. We celebrate Chrismakkuh in the Sky household so I tend to try to bring in elements of both holidays when decorating and/or being winter specific instead of holiday specific. 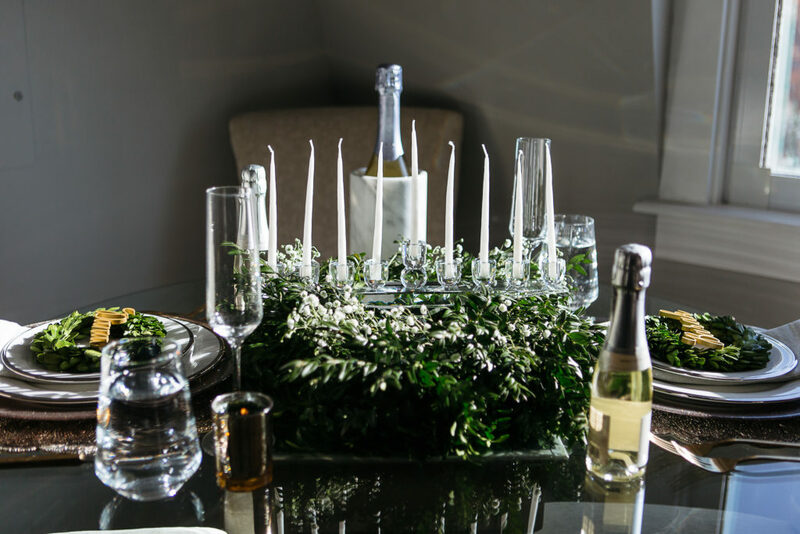 One of my favorite holiday tablescapes was last year’s winter white table. This year I wanted to go with more greens and mix metals, with the centerpiece being a beautiful boxwood wreath, that I accented with baby’s breath and our new (and super affordable) crystal menorah! I use them on our windows, this year as a part of our table centerpiece and on our shelving – the possibilities are endless! You could also add them to your credenza, hanging on the backs of your dining chairs, coffee table and more! The hubby and I really wish we had a fireplace! One of the reasons I want one is to decorate the mantle. Isn’t that why everyone wants a fireplace? Oh well, let me live! But anywho, if you have a fireplace and mantle – that is the perfect opportunity to dress it up for the holidays. 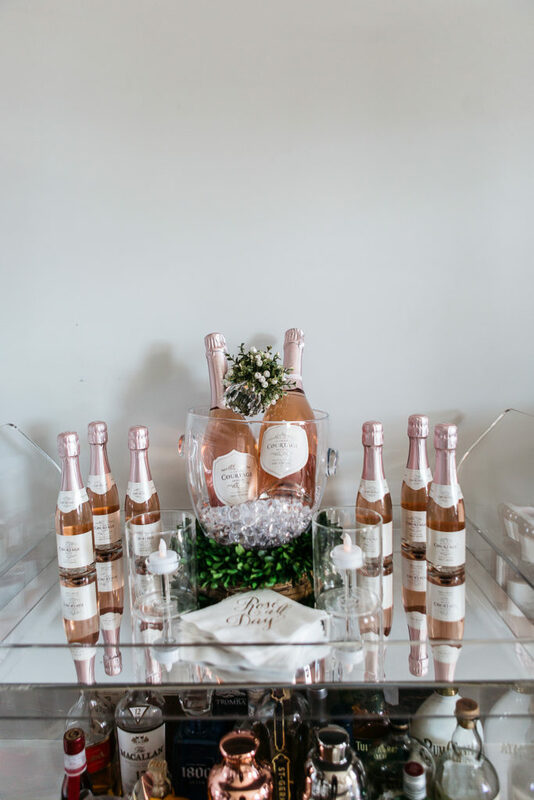 Add a pretty garland, decorative figurines, candles, and more! You may have noticed a few gifts underneath my tree already. I always choose a color scheme for my wrapping paper (last year it was marble). Since my holiday decor theme was mixed metals, I chose to go that route for my gift wrapping. There’s a method to my madness, everything goes together…down to the wrapping paper and gift bags darling! Use your gifts as an opportunity to style your home. If you have accent pillows on your couch, you could stop in your local Home Goods and pick up some festive pillows to switch out or add to your everyday sofa look. Don’t have a throw blanket, maybe add a fur one or one that is holiday inspired. Scented candles are a MUST in our home, we literally light candles as soon as we walk in the door until we go to bed. Seriously, the amount of candles we go through is probably crazy. I love a good scented candle though and the romantic light it gives to a space. 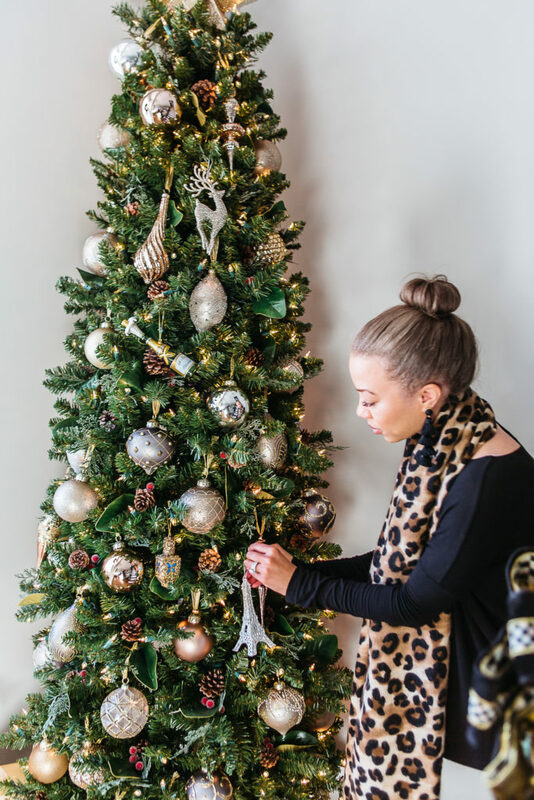 There are so many holiday scents that you can purchase to create that festive environment. Don’t find a scent you like but love the vessel the candle comes in because it matches your decor? Do your thing girlfriend. Been there, done that – anything for the look!